SIS presented two graduates with Alumnus/a of the Year awards during the inaugural Global Leadership Dinner held at the Ethiopian Embassy on May 4. “Started in 1998, the SIS Alumnus/a of the Year award is given to someone who exemplifies the values of the school, is a change agent in the community, and helps to make the world a better place, whether working in the public, private, or nonprofit sector,” said SIS Dean James Goldgeier in his opening remarks at the award reception. 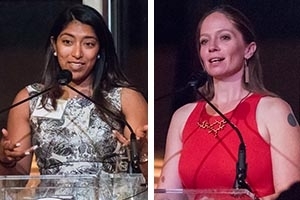 This year, the award committee honored two alumnae: Davina Durgana, SIS/PhD ’15, a human trafficking researcher and statistician, and Kayla Williams, SIS/MA ’08, the director of the Center for Women Veterans. “The committee brought me two amazing nominees and asked me how on earth we would choose. I said, ‘we’re not choosing, because we’re honoring both of them.’ Both Kayla and Davina certainly embody the school’s mission of service and waging peace,” Goldgeier said. Davina Durgana develops statistical models that track the location and vulnerability of human trafficking victims. As a statistician at the Walk Free Foundation, Durgana researched and co-authored the Global Slavery Index, which measures human trafficking in countries across the globe. Earlier this year, she landed on the Forbes “30 under 30: Science” list for her contributions to the fight against trafficking. After several years working at different human trafficking organizations, Durgana realized that applying her statistics background to her work could help shape future anti-trafficking efforts and legislation. “Statistics not only help us to understand the scope and scale of the problem—where it’s occurring and who’s affected—but also help us to target our intervention efforts,” said Durgana. Currently, Durgana and the Walk Free Foundation are developing the first joint global human trafficking estimate with the International Labor Organization, slated for release this September. “It’s one of the biggest collaborative efforts in our field,” she said. Kayla Williams exemplifies the SIS call for “leaders ready to serve.” A former sergeant and Arabic linguist in the US Army, she is a long-time advocate for female veterans and now serves as the director of the Center for Women Veterans at the US Department of Veterans Affairs (VA). Williams enlisted in the Army with the intention of challenging herself, learning a new language, and securing graduate school funding. On September 11, 2001, she became certain that list would also include going to war. Williams deployed as part of the 101st Airborne Division during the 2003 invasion of Iraq, a time when the Army experienced a “desperate need” for Arabic translators to communicate between US forces and Iraqi citizens. “I ended up going out on combat foot patrols with the infantry in Baghdad, as a woman, in an era when women were still technically barred from direct-ground combat jobs and units,” she said. That’s when she began advocating for female veterans and their service, with the goal of increasing their visibility among the general public and in the VA. In 2009, Williams even testified before the House and Senate Committees on Veterans’ Affairs about the VA’s ability to provide proper care for female veterans. While continuing her advocacy work, Williams enrolled in SIS with the help of the GI Bill. “As I reflected on my experiences in Iraq, I decided that I wanted to make a difference without carrying a gun,” she explained. At SIS, Williams soon found that her military service provided a practical perspective on international relations theory and that, in turn, informed her deployment in Iraq. Williams has also penned two memoirs about her experiences in and out of the military: Love My Rifle More Than You: Young and Female in the U.S. Army and Plenty of Time When We Get Home: Love and Recovery in the Aftermath of War.